Greg Eden, who scored two tries for Castleford Tigers against Catalans. Flying winger Greg Eden crossed for two tries as Castleford Tigers made a winning start to the new season at a cold Mend-A-Hose Jungle. While the game never hit the heights it was a solid display by the Tigers in which they showed the work they have been doing on defending could pay dividends this year. 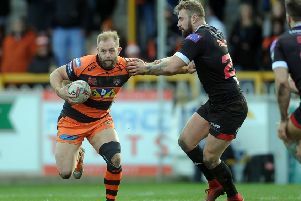 Catalans, tipped by some to reach the play-offs, were kept to just one try despite having plenty of pressure on the home line while Cas were clinical in taking their chances when they came. Castleford led 12-0 at half-time after a solid first 40 minutes in which they scored two tries and defended their line strongly. The first sign of a score came on four minutes when winger Greg Eden could not beat the last man and was tackled five metres out following a slick left edge move. Catalans showed they had not come to make the numbers up as they forced three goal-line drop-outs in the first half, the first of them from Tony Gigot’s kick on six minutes. The French team looked set to score when Lewis Tierney collected Sam Tomkins’ grubber kick and raced for the line only to be tackled into touch by Greg Minikin. From the following scrum the Tigers made their way up field on a great set and did open the scoring when a back tracking Dragons defence left a gap near their line and Paul McShane was quick to spot it to race over from dummy-half. He converted his own try to make it 6-0. New Catalans half-back showed his worth with a couple of kicks that forced drop-outs and a 40-20 kick, but the pressure came to nothing with Cas tackling well and looking well organised. The Tigers were put on a team warning by typically over officious referee James Child after conceding their fifth penalty in the first half-hour, but they were then awarded a penalty and McShane took the chance to kick a goal that stretched the lead to eight points. Five minutes before half-time Cas got another glimpse of a chance and took it as Peter Mata’utia and Michael Shenton combined well down the left to give Eden space to run into. The speedy winger did the rest, reaching out as Tomkins attempted to tackle him and grounding the ball just over the line. There was no touchline goal from McShane, but the Tigers had a 12-0 half-time lead. They started the second half strongly, but Alex Foster was tackled just short of the line after Jordan Rankin’s high kick was batted back by James Clare. The next high kick, from Jake Trueman, brought a penalty when a chaser was obstructed and McShane kicked another goal to make it 14-0. The pressure was maintained as Trueman’s grubber forced a goal-line drop-out and Adam Milner chased his own grubber over the line and could not quite reach it, but had the consolation of another drop-out. Clare was tackled just short of the line after Mata’utia’s break and pass gave him the chance to attack the line. Catalans, aided by several penalties, forced some pressure of their own with Matt Whitley held up over the line. They forced their way back into the game when Tierney raced over in the corner to complete a good handling move, although Sam Tomkins could not add the touchline conversion. Another dangerous attack ended when Samisoni Langi was tackled by Trueman after the ball had been kept alive on a sixth tackle play. But Cas survived with some more strong defence and clinched victory three minutes from time as Eden squeezed in at the corner for his second try after taking Shenton’s pass. McShane’s touchline goal completed the scoring on a satisfying first outing. Scorers - Castleford Tigers: Tries McShane, Eden 2; goals McShane 4. Catalans Dragons: Try Tierney. Castleford Tigers: Mata’utia; Clare, Minikin, Shenton, Eden; Trueman, Rankin; Watts, McShane, Millington, Sene-Lefao, McMeeken, Massey. Subs: Milner, Moors, Foster, Cook. Catalans Dragons: Tomkins; Mead, Langi, Williame, Tierney; Gigot, Smith; Simon, Da Costa, Moa, Edwards, Garcia, Casty. Subs: Bousquet, Whitley, Goudemand, Baitieri.